You are currently browsing the tag archive for the ‘Pulitzer Prize’ tag. The members of Ramsey’s safari have gained a story they’ll tell for the rest of their lives. It will prompt some of them, years from now, to search for each other on Google and Facebook, unable to resist the wish-fulfillment fantasy these portals offer: What ever happened to…? In a few cases, they’ll meet again to reminisce and marvel at one another’s physical transformations, which will seem to melt away with the minutes. I have a tendency to avoid literary award nominees (and goodness, I feel sorry for anyone mentioned in Christopher Priest’s rant about the Arthur C. Clarke award!) but this Pulitzer-winner was recommended to me by no less august a figure than Joseph Reich himself. So I figured I’d give it a lash. If you’re curious what sold me on the book, it was the mention of Egan having written a chapter as a powerpoint presentation. Turns out I’ve already reviewed a book by the author – The Keep – which I enjoyed, so I felt comfortable cracking the spine on this book. 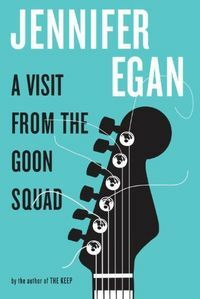 A Visit From The Goon Squad dips into the lives of a series of interrelated characters over a non-linear sequence of time. As such we only briefly get to ‘meet’ these people, but their associations with one another bring them to life. The one constant throughout the book is music. These characters are aspiring punks, record company employees, PR gurus, failed rockstars. The chapter by chapter hops, skips and jumps through time (Nathalie Sarraute how’re ya!) capture beautifully that sense we have of our lives passing by. Even in the moment itself, the very same moment that in years later becomes a totemic symbol for what came after – or the road not taken – it can feel as if that intangible sense of now is already slipping away. What also works quite well is how the enthusiasm of youth versus the bitterness of weary experience is captured in Egan’s Venn diagram of lives. That same enthusiasm and disappointment lends itself to a certain pretentious turn of phrase and what I love is how pretension is touched on without the book itself being pretentious. Yes, even the Power Point presentation chapter. So thankfully this book did not feel like trudging through Don DeLillo‘s Underworld again. The focus on music is a clever away of providing a linking structure that neatly avoid portentousness, affording even a lightness of touch. Unfortunately the very concluding chapter of the book lost me. I think it was because for the duration of the book there was this brilliant drawing of parallels between the different time periods linked only by music – characters aging and then suddenly whiplashed back into youth on the page – there was this sense of commonality. This was then oddly subverted by the last section of the book nominally set in what is presumably ‘now’. Here Egan suddenly introduces the idea of language itself changing. Of course the notion of text speak somehow replacing the English language is not a new idea. From those deathless office emails with the subject line ‘Cna Yuo Raed Tihs?’ all the way back to post-Enlightenment era French campaign to preserve the sanctity of the French language itself from mongrel lexical mutations, there’s been this repeated concern that language itself is somehow becoming less. Which is of course nonsense. I wonder if what was intended was that the textspeak, like the Power Point presentation, becoming meaningful and full of emotion shows that this constancy will remain even as these characters live and die. Their experiences, so flush with significance for them personally, are but passing moments in time. The book’s title is tellingly referenced by the recurring phrase ‘Time is a goon’, cleverly summing up the intangible sense of harshness about mortality. Music is the perfect metaphor for that sense of passing. This is a brilliantly written book and Egan is to be praised for not indulging in po-faced musings on mortality. Sadness and joy ebbs and flows from page to page.